Flow monitors for solids assist to detect early disturbances at the transport of powders, dusts, pellets or granules early. Thus problems arising from blockages, material absence or system-related can be prevented reliably. Different measuring principles guarantee the optimal sensor for every application. monitors the mass flow of solids. Flow Monitor 500M`s function is based on the of the Doppler effect. The sensor creates a microwave field. If solids move through this field, the microwaves are reflected and received by the sensor again. This is then converted into a switching process. The sensitivity of the sensor can be adjusted continuously and this enables a variable determination of the switching point resp. a switching process for different mass flows. 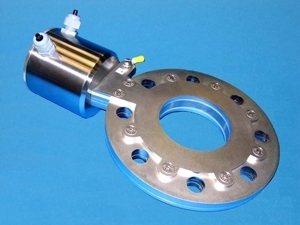 The sensor can be installed in pipes, conveyor belts, fall plates or in similar transport facilities. The installation is simple, and the commissioning easy. Flow problems with transports or the feeding of powders, dust, pellets, or granulates can be detected early with this device. This helps prevent serious difficulties that can occur due to clogged piping, material loss, or other technical problems with the system. 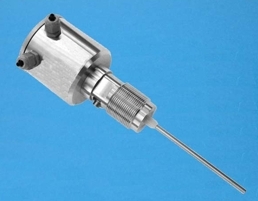 The Flow Monitor 700E`s function is based on a modified triboelectric principle detecting particles interacting with the sensing rod and particles just passing the rod. Build up on the rod surface will not be detected. Only moving particles generate a flow rate proportional signal which is monitored by the electronics. 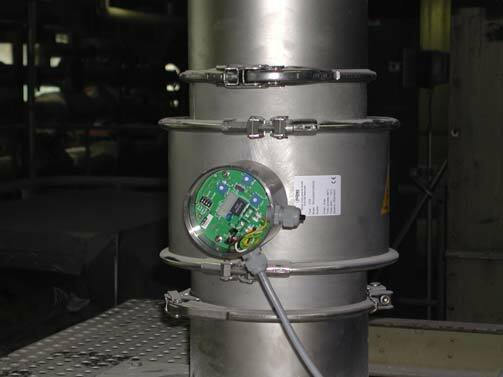 The sensing monitor is installed on the clean gas side, downstream of the filter at a metal duct by welding on of a thread bush, boring through the duct wall and screwing in the dust monitor. The dust monitor can not be used with products, which build an electric conductive coating between sensing rod and pipe wall, caused of abrasion. The 600E solids monitor helps to monitor & control control the mass flow in solid material handling applications such as pneumatic transport lines, feeders or gravity chutes in a wide range of mass flow from g/h to t/h. Flow problems with transport or the delivery of powders, dust, pellets, or granulates can be detected early with this device. This helps prevent serious problems that can occur due to clogged piping, material loss, or other technical problems with the system. The monitor detects moving electrical charges that are produced, for example, through friction with other objects such as the pipe wall and then naturally adhere to the solids surface. The multiple-use measurement principle on which 600E is based is the physical effect of the electric charge of solids particles. This occurs naturally as with, for example, friction or collision with solids. 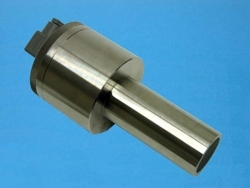 With a ring sensor, the measurements are taken integrally and without contact over the pipe cross section. The electrically charged particles produce (induce) a charge signal against the grounded conveyor duct. On the basis of statistical fluctuations in the particle flow, a current noise is produced which depends on the solids concentration but also on the solids velocity. Stationary particles such as sediments do not contribute to the results. A multitude of sensor mechanics of the ESR ... /m/... series makes process coupling very easy and allows cost effective solutions for almost any monitoring application - also in existing conveying systems. The advantage of this modular concept also appear in case of refit or exchange. Industries:animal feed industry, building materials industry, production of ceramics, chemical industry, detergent industry, food industry, glass production, metal production, pharmaceuticals, pigment production, power plants, production of rubber goods, recycling, industry, synthetic materials, production of textiles.